Any help would be greatly appreciated. 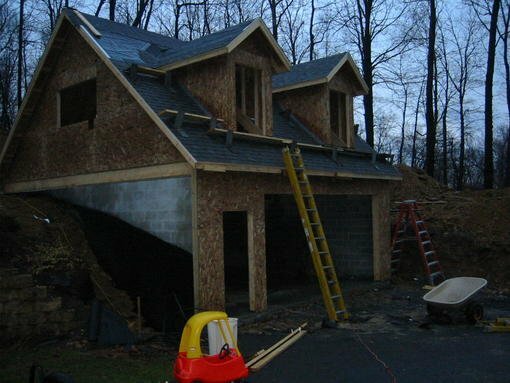 I built a 2-story garage into a hillside in Pennsylvania. Access to the upstairs is via the rear since it's buil into the hill. The entire first floor is block. The block as also been triple coated with tar. The problem I am having is that in the summer, the air is very humid and the bottom area is very cool. The back wall can has been seen at about 65 Deg F in the summer. As you can imagine, the backwall has mold growing due to a cold wall with a lot of humidity from the outside air. The backwall has about 4 feet of mold. The side walls start at 4 feet in the rear ad gradually lowers since the grade tappers down. Any ideas on how I can solve this problem without a dehumidifier running 24/7 in the summer? The concept is easy, but the details may not be. What you need to do is to keep the moisture from the cool surface and you do that by warming up the surface that the moisture contacts. There are insulation panel that you can install on the outside, but that that requires digging up the outside down to the footers. In some ways that is a better insulation system with the mass on the inside. But you will still have a slight condensation problem. In the spring time after you have cold weather there will be a couple of days when it gets warm and humid. After a day or two the blocks will reach tempature and the condensation will dry up. The other method is to treat the space as a basement and finish it appropriate. But you will loose a little in side space. Basically what you want to do is to install sheet foam insulation against the blocks. You want them sealed so that air can not get behind them. Then either build wall in fron of it or put strappling strips on it and then drywall. You can get the blue or pink board at the big box stores. But Dow also has a version called wallmate that has groves for the furning strips. You can get more information on insulating basements here. Do you have any recommended thickness or R-vaule recommendations? I as going to do that and then install pegboard (more for decoration then hanging items). 2" is typically used in a basement where you are heating it and trying to keep heat losses down. I am not sure, but I am guessing that for this 1" would work. But if you use wallmate it starts at 1.5". IIRC the local HD has the extruded in 1 and 2". You must kill the mold growth first before putting up the insulation or you will be creating a cavity for the mold to flourish. Do NOT use bleach, it is not considered a good biocide. If you have any moisture coming through the block, it can bring bacteria/mold with it. My suggestion is to consider the use an air exchange system to create airflow and it will wick the moisture off the wall. I have a concrete garage with a concrete slab top, so I have the same issues. Insulation will only trap moisture back there and you will have billions of mold spores inside your garage just waiting to cause havok. If you cover mold, it is still there. If you properly sanitize the wall before you put up insulation, you could be OK. However, if you do decide to put up insulation, you may want to check behind it after a few months to check for growth. If you continue to have mold growth, it will seek out any organic material to feed on...such as leather interior of a car...etc.